Female Head Display with Realistic Facial Features. This Female Head Display comes complete with the full stock of everything that you could ever need to generate a beautiful image in the consumer's mind. 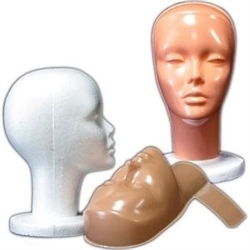 Female mannequin head is made in fiberglass with full make up. Made in fiberglass reinforced plastic material and will hold up under heavy use. Great for wigs, hats, scarves and jewelry.